I just found out The Economist has a daily chart feature! It did leave me with a few questions though…..who did they count as cabinet ministers? I don’t know enough about the governments in these countries to know what that equates to. Also, why average vs median? I initially thought this chart might have been representing Congress, not the Cabinet. I took a look at my old friend the Congressional Research Service Report and discovered that at the beginning of the 112th Congress in 2011, the average age was 57.7 years, which would make this chart about right. I had to dig a bit further to get the ages of the Cabinet, but it turns out their average age is 59.75. I was surprised the data points would be so close together actually….especially since that 57.7 was for Jan 2011, so it’s actually 59.2 or so now. In case you’re curious, 7 members of the cabinet are under 60. The youngest is Shaun Donovan (46), Department of Housing and Urban Development. The oldest is Leon Panetta (74), Department of Defense. Panetta is actually the only member over 70. Half of them are in their 60s, 5 in the 50s, and 2 in their 40s. I felt a little ashamed I only could have given name/position to 5 of them before looking them all up. That’s not great, especially when you realize I’m counting Biden. Still, I comforted myself with the fact that I bet that beats a very large percentage of Americans. A quick look for other data suggests that median age of populations is the more commonly reported value. 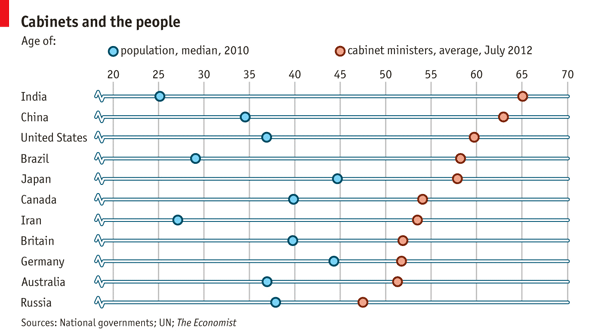 The median age of the cabinet was actually 61, in case you’re curious.